Granola gets a bad rep. Generally speaking, granola is something that most people who are trying to watch their macronutrients and reduce sugar try to avoid, but you don’t have to avoid granola altogether. 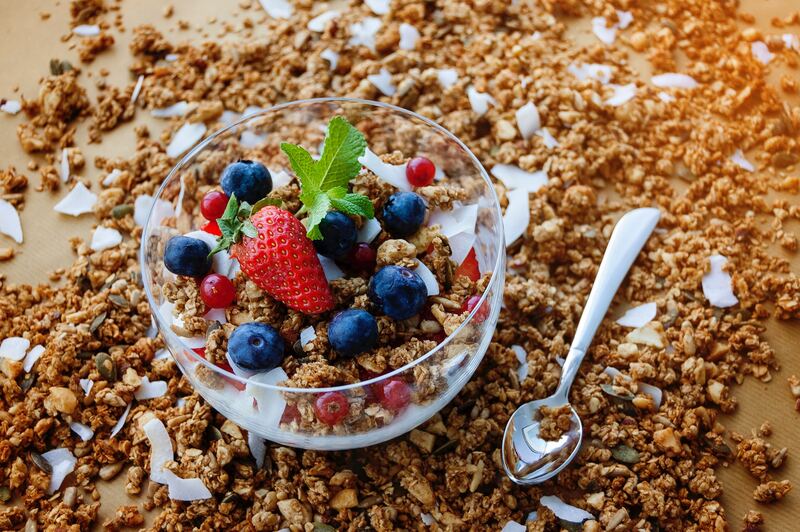 In fact, granola is one of the easiest breakfast options out there. It is so easy to just grab out of your cabinet and go. The big reason why granola gets its bad reputation though is due to a lot of granolas having quite a bit of sugar in them. If you are someone that is watching their nutrient intake the last thing you would want to do is basically eat candy for breakfast due to not knowing that your granola had just as much sugar in it. When looking or a granola, you should look for one that has less than 8g of sugar per serving, whole ingredients, and healthy fats. The great thing about granolas these days is that a lot of them have added superfoods in them like hemp, chia seeds, and a variety of adaptogens. We have searched high and low and it is pretty hard to find a granola with less than 8g of sugar due to honey and fruit that is a big component of what makes granola, well granola. Your body can handle sugar better in the morning, so we don’t worry about it too much. Okay, so now granola is back in your life… how should you eat it? I swear this is like a match made in heaven. Yogurt offers a wonderfully smooth texture packed with protein (think of yogurts like Greek varieties that contain more protein) and granola just gives it a nice flavor boost while adding that nice crunch in your mouth. Sticking to plain yogurt when paired with yogurt is your best option as you would just be adding more sugar into your breakfast if you went with a flavored yogurt. Remember the kid snack aunts on a log? This is so much better than that. Slice up a banana, smear some nut butter across in the length and then sprinkle it with granola. The tried and true way, just reaching your hand into the granola bag, grabbing a small handful and you are on your way. Simple and easy delicious snack right in your hand ready to throw back into your mouth. Smoothies are amazing because you can put in whatever you like, we like to stick to a leafy green, some fruit, a milk alternative, our whey protein and blend it all up. Sometimes though, drinking breakfast just doesn’t quite do it so next time make it a little thicker and sprinkle some granola on top. Your brain will enjoy and feel more satisfied chewing your breakfast instead of just eating it.